Navy Lakehurst Historical Society, Inc: This is a terrific site dedicated to preserving the history of the base. Here you will find all types of information on air ships, a detailed look at Hangar 1 and a terrific museum. In 1926, a small group of modelers were given permission by Commander Charles E. Rosendahl (the father of airship development in the U. S.) and base Commanding Officer E. S. Jackson, to use the newly finished Hangar 1 at Lakehurst for Indoor Free Flight (FF) aero modeling. Between 1926 and 1930 Indoor Modeling was able to develop in this large space. In 1931, the first major indoor FF competition was held in Hangar 1, hosted by the Lakehurst modeling group. This event marks the formal origin of the club we now call the East Coast Indoor Modelers (ECIM). The original club logo was also developed in 1931. The club was founded before our national aero modeling organization the ”Academy of Model Aeronautics” (AMA) was founded in 1936. The AMA is the officially recognized aero modeling section of our National Aeronautics Association (NAA). The AMA is the official US representative to the Federation Aeronautique International (FAI) the world wide organization governing all aviation records and competitions. Merrick “Pete” Andrews (1914-1992) was one of the originators and the founder of the club. Among the many FF records he established here, he also helped to promote Indoor Modeling throughout the New Jersey and Philadelphia school systems. Weekly building sessions were held at the major educational facilities and several department stores (such as John Wanamaker). Newspapers like the Philadelphia Inquirer published model plans and competition results to help further the hobby. Hangar 1 served as a haven to these aviators, where up to 200 young flyers would gather and compete. Today's competition indoor free flight models are constructed of balsa wood and are covered with tissue or film, are powered by wound rubber bands, and weigh only a few grams. The international class FAI F1D models require great patience in construction and are used in local, regional, national and world championships. Some models flown in Hangar 1 have won these events. The club sponsors indoor competitions several times a year including a team selection competition prior to World Championships. National and World records have been set in Lakehurst Hangar 1. The majority of the free flight modelers are serious competitors. There were several gaps in our use of Hangar 1 throughout the years. The most notable were the World War II years. In 1953 a national competition was held in Hangar 1. During that event one model achieved a record flight duration of 45 minutes. The highlight for the club was the FAI F1D Indoor World Championship held in Hangar 1 in 1974. The most recent short gap occurred right after the events of September 11, 2001. More than 15 national records were set in Hangar 1 in 2007, with some models staying airborne for more than an hour on a single wind of the rubber "Motor". In 1998 a few club members started flying small and light weight electric powered indoor Radio Control (RC) airplanes and the “ECIM RC Slow Flyers“ division was formed. The R/C models must meet certain safety standards for maximum motor size, weight and speed and typically cannot be flown outdoors. While most of the R/C slow flyers are recreational sport flyers there are a few who fly in FAI category F3P Indoor Aerobatics competitions. Today, the ECIM club works in conjunction with several organizations to perpetuate this superb facility. Being one of the oldest modeling clubs in the world, we are very proud to continue our tradition at our original flying site. Some of our present members have been flying here for over 50 years!! Our membership consists of folks from every walk of life. We have retired professionals, retired military, military veterans and a few young people as well. The ages range from 18 to 92 with a median age of 64. At present, the club has 132 members with about 25 regularly flying in Hangar 1. We all do our best to serve as an extra pair of eyes for the base security folks. The ECIM club is most grateful to Joint Base McGuire-Dix-Lakehurst for their continued support of our activities. 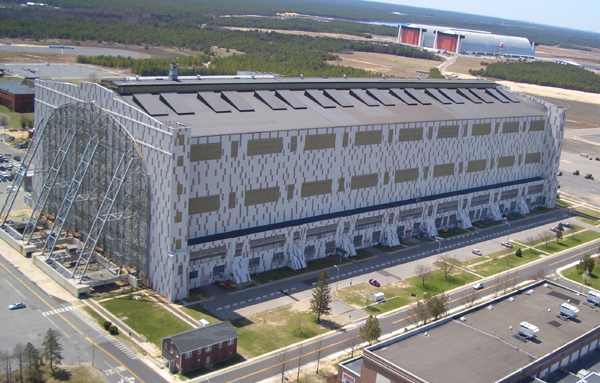 Lakehurst Hangar 1 is a unique facility without which our club could not exist nor have accomplished the many records set there. Many of our members also belong to the Navy Lakehurst Historical Society to help preserve historical Hangar 1. For the last 10 years the club has made significant donations to the Navy Relief Fund and Navy Lakehurst Historical Society. More recently we have made a donation to the Air Force Assistance Fund.